Help an artist today. 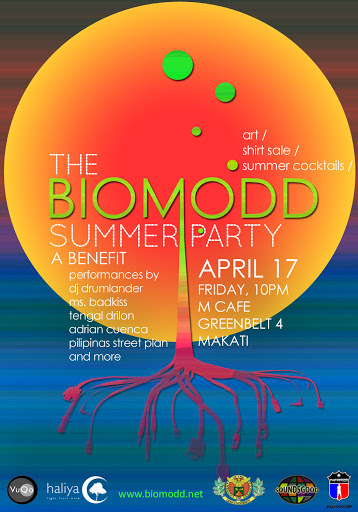 Party with us on April 17, Friday, 10pm, at M Cafe Greenbelt 4, Makati (across Ayala Museum) as we create art, serve custom-made summer cocktails, and flaunt cool graphic t-shirts. This event is open to all. Spread the word! Bring your friends! The Biomodd Project welcomes online donations. We accept PayPal and all major credit cards.